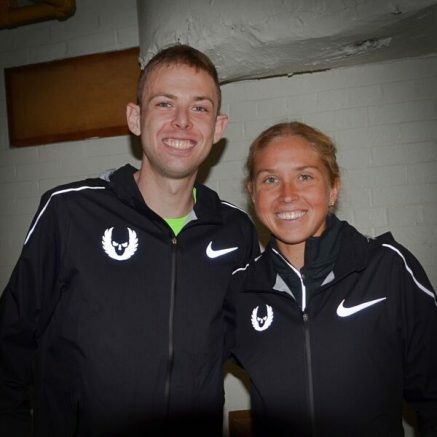 17th April 2017 – For the past 4 months Galen Rupp (USA) and Jordan Hasay (USA) have been building towards making their Boston Marathon debuts. Today, all their hard work was rewarded with two podium finishes and two personal bests. In the men’s race the half marathon was reached in 1:04:35 with 11 runners still bunched together in the lead pack as they headed into the Newton Hills after 25km. As they crested the infamous Heartbreak Hill and hit the 21-mile mark Galen and Geoffrey Kirui had broken clear as the undulating road and rising temperatures began to take their toll. The two were still locked together and running stride for stride through 22 miles but Kirui made a break in the 23rd mile and pushed hard for the win. He slowly built a gap on Galen but Galen was strong right to the end and enjoyed his run down Boylston Street to cross the finish line in second place and set new personal best figures of 2:09:58. After the race Galen said “I just didn’t have an answer for him (Kirui). He ran an incredible race – just give him credit. He was able to close really strong. I was really happy with the race I ran though. I wasn’t sure I was even going to be able to start two weeks ago. It was like an experience I’ve never had before… It (the Boston marathon) definitely lived up to it and exceeded expectations. The women’s race passed halfway in 72:33 with 6 still in contention. With Jordan making her marathon debut from hereon she was stepping into the unknown, but she showed she has the make-up to be a world class marathon runner by running a negative split and fighting hard for every place up to the finish, crossing the line in third place in 2:23:00. Galen has now run three marathons, winning the American Olympic Trial on his debut, taking bronze at the Rio Olympics and a second on his major marathon debut. Jordan’s debut was the fastest ever by an American female and it places her fourth on the American all-time list, as well as top of the PACE all-time rankings.